Orange announces the third generation upgrade of the OPC guitar amp and computer, which will be on demonstration at Winter NAMM 2013. The Orange OPC now features an unlocked 2nd gen Core Intel i7 CPU with 8 virtual cores, while the RAM has been doubled to 8GB DDR3. The Orange OPC has been upgraded and is ready for Pre-Order from the new website www.orangeopc.com for delivery within the UK by the end of April and will be shipping outside the UK shortly after. New Orange OPC video on AudioFanzine. The OPC has undergone significant specification improvements and at NAMM the company will be debuting the final production spec product. 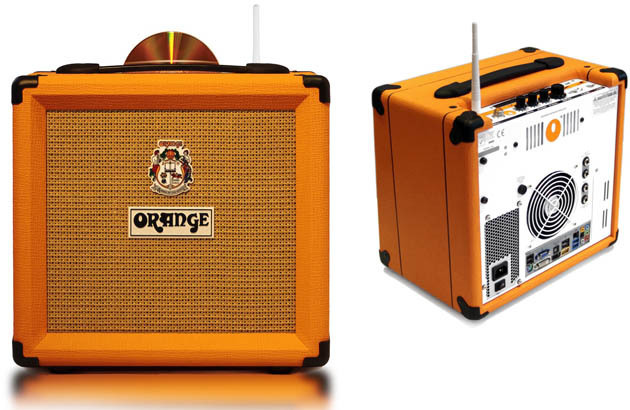 Orange Amps released OPC Price which includes over £700 free Software. Orange Amplifiers, the British based manufacturer of guitar amplifiers, announced the launch of the all-in-one computer amplifier speaker – The OPC.